Every Thursday in the week of a full moon, those practicing Kalachakra gather to perform an offering feast known as “Tsok”. 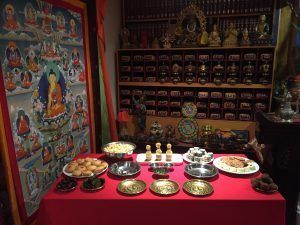 This short ceremony is an opportunity to purify negative actions and to generate great stores of positive merit by making food offerings, chanting prayers and playing musical instruments. Following the ceremony, we all head upstairs to have a tea and eat the offerings together.